My friends Natz and Amit paid me a visit, making one of my weekends less ordinary. It was a few days of fun-filled activities; Yo and her family were also part of the happenings. Where did I and Yo brought them? Here are places we went and the activities we did. 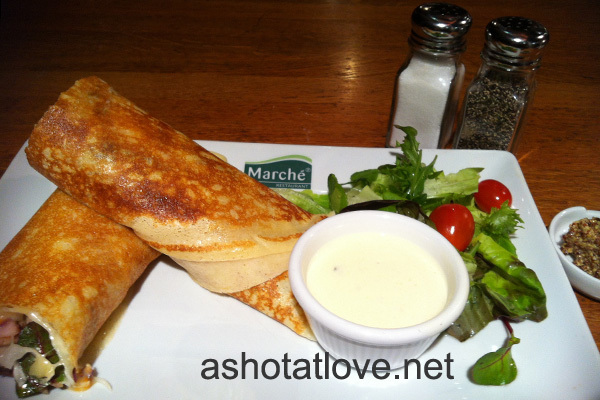 • Dinner at Marche – a Swiss restaurant that offers a tranquil ambiance, fresh and quality food. • Amit tried the sport of body flying in iFLy Singapore. It is said to be the largest wind tunnel indoor skydiving in the world. I tried indoor sky diving once in Resorts World Genting and it’s way cheaper there. Check out the indoor skydiving video I made. 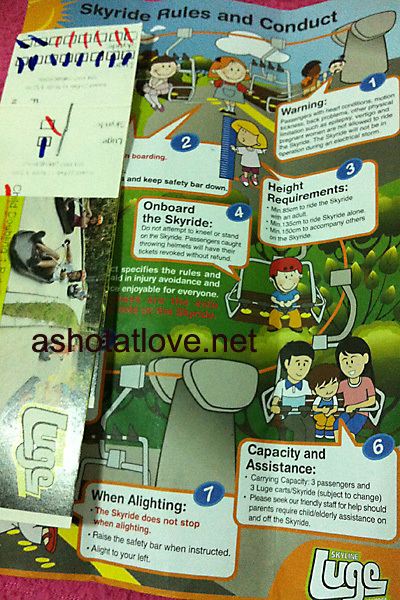 • Luge Sentosa which is part go-cart, part-toboggan action ride that’s suitable for all ages. I thought this ride would be boring but if you’ll do it like a race, it’s gets exciting. We did this twice and I won on the first race! • Watch Crane Dance – a combination of ground breaking audio and visual technologies, astounding light and water effects. • Dinner ay Din Tai Fung – a Michelin star awarded and ranked as one of the world’s Top Ten Best Restaurants by The New York Times. It’s all about love for dim sum and dumplings! Work plus these activities is equals to cumbersome. Though touring friends can be fatiguing, the experience is simply priceless. After a tiring day at work, I went for a swim with my former housemates. I plunged in the pool as soon as I get there. Jon agreed to teach me how to swim making me do frog kick for my first lesson. Anne brought with her her Cybershot TX10 which is an underwater camera so we took a lot of underwater photos though it is not allowed. The activity was followed by a sumptuous dinner at Anne and Laurence’s house after, bessie’s Caldereta satisfied our appetite. Missed opportunity – Yesterday I confirmed on a brochure modeling shoot for tuesday. Part of the details given is that I would pose like I’m patiently learning how to cook which I think is with other models of different races. I’m cool with all the details given and was so excited about; the agent texted me this afternoon that the client want to move the shoot date. Sadly, I am working on all the date options they gave me. 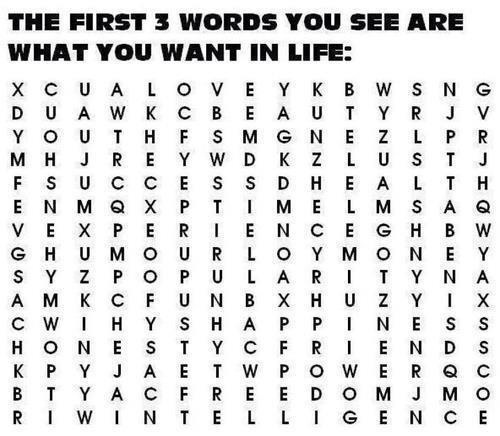 I got Love, Intelligence then Beauty. I’m feeling happy that I am flying to Manila today. Though I’m still at the train right now and hoping that I can check in on time, im having all good vibes. 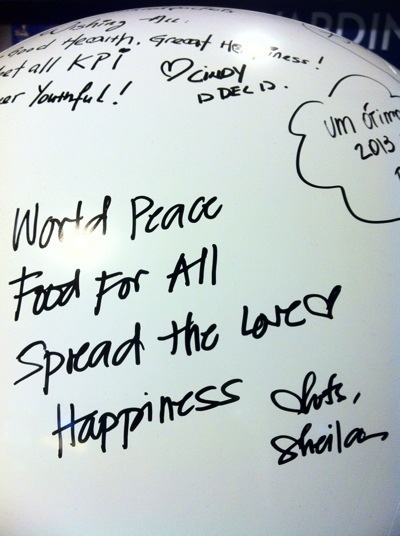 I was also able to write something in a wish ball. It’s gonna be floating at Marina Bay starting new year. I hope I can get a photo of that some time.